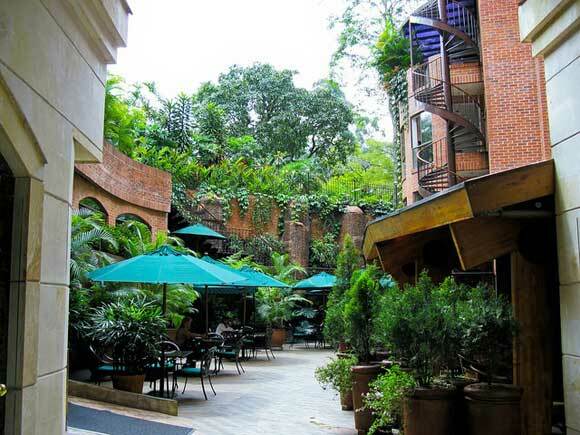 I am not usually a big city girl, but my husband Dave and I liked Medellin, Colombia’s “City of Eternal Spring”, so much we extended our planned short stay here to over two months. Not only is Medellin very pretty, but it’s also very cheap and easy to get around…and get around we did, walking and making the most of the cheap and comprehensive transport options including a fantastic metro system and affordable taxis. 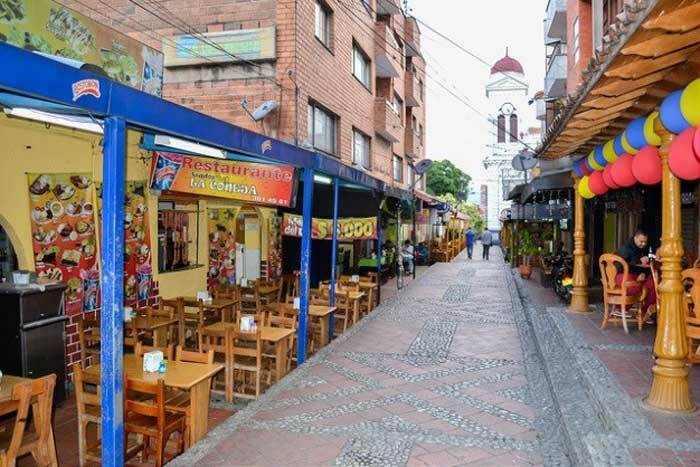 Walking in the city centre and valley suburbs or barrios is great as the pavements are beautifully paved and wide. In the suburbs, there’s plenty of shade under the lush large trees in this garden city. As with anywhere, here, we had to be careful crossing the road but there are many controlled crossings, so it was usually easy. In parts, we had to keep our eyes out for cyclists whipping past as we discovered there are cycle lanes incorporated into many pavements. Locals cycle a lot, some on their own bikes but mostly making use of the hundreds of free bicycles available from stands at most parks. You’ll find lovely parks on every other street or so. To make use of the free bike system, you need to register. This takes a few weeks to process, if we had stayed longer we would have got into this system. In the city centre, some of the shopping streets are pedestrianised. Key to our fun, low-cost, easy travel in Medellin was the city’s metro system. It’s world class, cheap and clean. It incorporates trains elevated above the streets, buses, trams, cable cars and escalators. For the years it took to build, locals were promised a ‘democratic metro system’, that would belong to the people and give affordable access to everyone. It certainly delivered on these promises; it is magnificent; connecting this valley city including the poorer barrios up in the hills. The locals sense of pride in their metro is shown every day as we never saw a drop of litter or graffiti in any of the transport vehicles or in the stations. For just $1.20 you can travel far, changing lines easily, even changing from rail to cable car as long as you stay in the system. We used the elevated rail system to get to the all the main tourist attractions. Botero Plaza has its own metro stop. This square in the middle of downtown is great, its star attractions are a score of huge brass sculptures by Colombia’s favourite artist, Fernando Botero, and with street vendors, tourists and street performers it’s a great spot to people watch for a couple of hours. We found the best empanadas at a small stall on the square for just 60 cents. While there we were happy to pay the $2 entrance fee into The Museum of Antioquia, which is actually an art gallery. 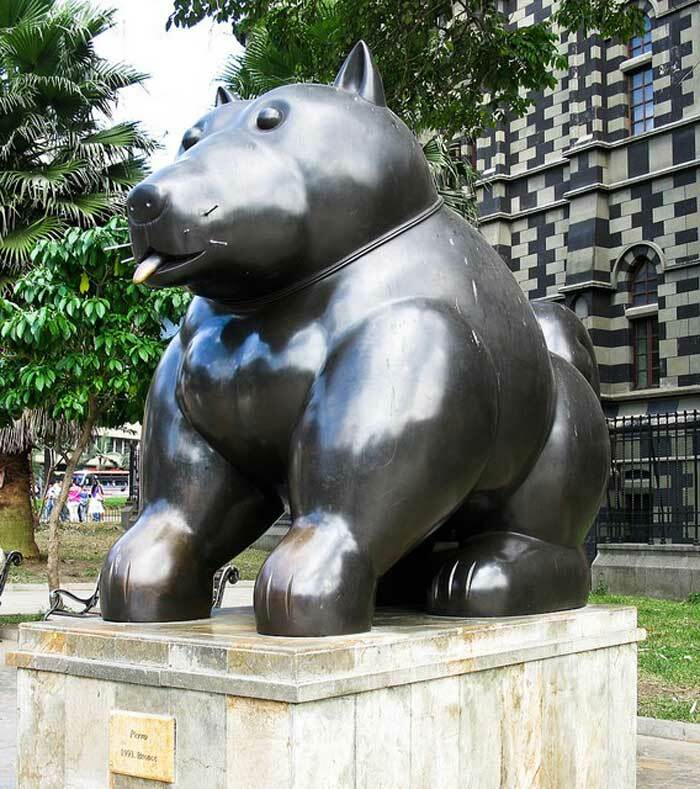 It was filled with awe-inspiring paintings by Botero and works by other Colombian artists which Botero collected during his lifetime and gifted to the city. Another rail stop took us to the Botanic gardens, admission is free. They are truly lovely. We visited a few times; on Sundays, family day in Columbia, it was heart-warming to see multi-generational families enjoying the lakes, gardens and massive resident iguana. One Sunday a month the gardens host an excellent Organic Fair. We had delicious ice cream and hot food and took away wonderful produce and chocolate. We found the official cafes in the Botanic gardens expensive so were more than happy to tuck into the fair offerings instead. There’s also many vendors outside the garden’s entrance selling cheap food and drinks. We took the metro system to the national park—Arvi Park. Getting there was definitely part of the fun because from the rail we took the cable car for the 15-minute journey over the hills to the park with fantastic views of the city, all included in the original $1.20 fare. Some days we would just go to our closest rail station and go exploring. We discovered many gems; we rode through a shopping precinct in a cable car, we rode street art decorated escalators up into a suburb way up in the hills. Another time we took a train then a bus to a local produce market, enjoyed a delicious lunch and went home via taxi with fresh, cheap produce, cheese and meat. One particular day’s exploring was fantastic value as we caught the monorail, changing lines once and getting onto a cable car system to enjoy a 40-minute round trip cable car ride with stunning views then home again on the monorail. As we never left the metro system, so this day’s entertainment cost just $1.20 each! Medellin taxis are yellow, plentiful and seriously affordable. I estimate they make up half of all the vehicles on the road. In this city, they are on a metred system, occasionally we had to remind our driver to start the metre so there’d be no hanky-panky with the fare. I learnt to try and get older taxi drivers as they know the routes better than the young ones and are not as likely to drive like a maniac! However you choose to get around it, Medellin is a great city. My advice…? Get there and go exploring. Sign up here for IL Australia’s e-letter and we’ll send you five free postcard e-letters weekly. We’ll also send you a FREE report on the International Living Australia 2018 Global Retirement Rankings.